$66,367 x 96 Months @ 4.29% APR (estimated financing rate, cost of borrowing $13,544). $0 down payment. Taxes included. Leather Seats, LED Cargo Box Lighting, Heated Seats, Safety Group, Advanced Safety Group! This Wrangler Unlimited has a lot of capability both on the road and off the road. Our Wrangler Unlimited's trim level is Rubicon. This 4 door Wrangler Rubicon Unlimited gets a special Rubicon hood decal to mark you out, plus kid plates, tool kit, two front tow hooks and one rear, Dana axles, Rock-Trac two speed transfer case, shift on the fly 4x4 system, performance suspension, fog lights, automatic headlamps, and aluminum wheels to take on the trail. For the drive to the trail head you get heated power side mirrors, 7 inch customizable instrument display, rear view camera, illuminated cup holders, leather steering wheel with audio and cruise control, remote keyless entry, power windows, 115 volt power outlet, and automatic climate control for comfort, plus Uconnect 4 with 7 inch touchscreen, Apple CarPlay, Android Auto, SiriusXM, Bluetooth, 4 USBs and and aux jack, ambient interior LED lighting, and 8 speakers to keep you connected on the way. 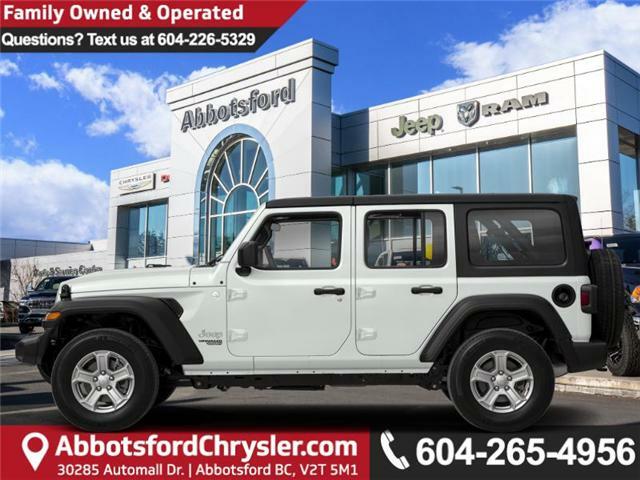 This vehicle has been upgraded with the following features: Leather Seats, Led Cargo Box Lighting, Heated Seats, Safety Group, Advanced Safety Group, Body Color 3-piece Hard Top, Remote Proximity Keyless Entry. View the original window sticker for this vehicle with this url http://www.chrysler.com/hostd/windowsticker/getWindowStickerPdf.do?vin=1C4HJXFG3KW594967. Total rebate of $1500 is reflected in the price. Includes $1500 Bonus Cash. 4.29% financing for 96 months. Buy this vehicle now for the lowest bi-weekly payment of $422.48 with $0 down for 96 months @ 4.29% APR O.A.C. ( taxes included, Plus applicable fees ). Incentives expire 2019-04-30. See dealer for details. * Every reasonable effort is made to ensure the accuracy of the information listed above. Vehicle pricing, incentives, options (including standard equipment), and technical specifications listed is for the 2019 Jeep Wrangler Unlimited Rubicon may not match the exact vehicle displayed. Please confirm with a sales representative the accuracy of this information.